The sequel sees Kingsmans elite secret agents join forces with their US counterparts, Statesman, in battling a mutual, ruthless enemy and saving the world from being held hostage. The reassembling of the original production and post production team ensured a continued strong work ethos, and provided the opportunity to expand on an already proven pipeline built around DaVinci Resolve Studio. It also allowed the team to achieve their objective of creating a unique final grade whilst still retaining the slick visual style of the first film. Supervising the editorial workflow was DIT, Joshua Callis-Smith, who worked with George Richmond throughout the shoot. From the start, we decided to use the same extensive bank of look up tables (LUTs) Rob [Pizzey] had originally developed for Kingsman: The Secret Service to maintain as much continuity between the films as possible, Callis-Smith begins. We had everything from day interior and exterior LUTs to looks for mixes of light such as Tungsten, which really sped up my workflow when it came to the DIT. On set, Callis-Smith viewed the live images on 25 inch OLED monitors which were calibrated to match the DI suite at Goldcrest, ensuring the same tools in DaVinci Resolve would flow all the way through to the latter stages of post production. A Smart Videohub was then used to route pictures to the video operator, who would in turn distribute those images to everyone else. If needed, we could even use Resolve to add vignettes as a secondary grade and track them dependent on what we wanted to use to correct the image he continues. Giving the dailies a look and visual style before it went any further down the chain protected the image so that everyone throughout the entire 12 months of post was constantly looking at and working off the same thing. Once principle photography was completed, the looks from set were then broken down and reconstructed from scratch by Goldcrest Posts Rob Pizzey, who created the final grade and delivered multiple HDR versions, including Dolby Vision for theatrical and HDR10 for domestic viewing. Kingsman: The Golden Circle was a much bigger proposition than Kingsman: The Secret Service, with more ambitious VFX shots, a wide variety of locations including Monte Blanc and Cambodia, as well as the HDR deliverable to consider, Pizzey explains. The opening sequence alone was complex, involving a night time car chase through London with the main character, Eggsy, and his black cab. It was a fast cut scene, and so we needed to use our grade to ensure Eggsy stood out against the black taxi and dark background, which was a challenge, he continues. Luckily, using Resolve really helped us throughout. It gave us the flexibility to work directly from the Alexa ARRI RAW files, and conforming and online editing in Resolve also allowed us to very quickly turn around any edit changes and VFX updates that took place. As for all our deliveries, the HDR grade would originate from the live DI timeline, so we could access any part of the original grade and finesse to achieve the best results in HDR. We showed George [Richmond] a little bit of it and he was blown away. Its stunning, the extra detail you get. He adds: Even with the extra latitude it gives, though, you always have to remember that grading the HDR version is not just about reproducing the REC 709 grade on a HDR monitor. It all depends on how the original footage was shot. On The Golden Circle we could justify sensitively opening up the contrast ratio as we had the dynamic range to work with. Used in a controlled approach, the results can be stunning. Our color pipeline has certainly evolved since the first Kingsman we all worked on together, but one piece of the puzzle has remained the same: DaVinci Resolve, Pizzey concludes. 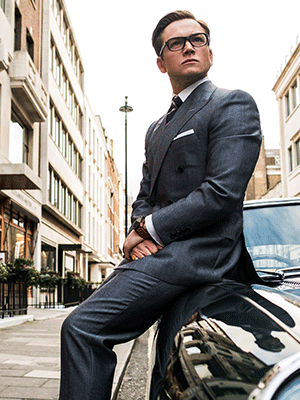 Resolve was central to the successful delivery of post production on Kingsman: The Golden Circle. Having a single piece of software at the heart of our workflow ensured color management remained consistent throughout the entire editorial pipeline, from DIT through to the final results.